Two and half weeks in NYC. Part I: Diner, Russ & Daughters, Prune, Mimi's Hummus, DiFara, Fette Sau, Ippudo, Tanoreen, Luzzo's Pizza, Kee's Chocolates, Yoghurt II, Arturo's, Minca, Artichoke, Num Pang, Lanzhou Hand Pulled Noodles, Xian Famous Foods, Best North Dumplings, Flower Shop Tofu Stand, Yi Pin, Ocean Jewel, Luigi's Pizza. Part II : Aburiya Kinnosuke, Jacques Torres, Little Owl, Clinton Street Baking, Kefi, Tai Yuen Bakery, Caracas, Numero 28, Sushi Yasuda, OMS/B, Dousoeur de Paris, Amy's Bread, Ruby et Violette, Azuri, Kyotofu, Company, Peter Luger, Momofuku Ko lunch and dinner, Perilla, Extra Virgin, Bespoke Chocolates, Dessert Truck, Babbo, Artisanal, Szechuan Gourmet, Cho Dang Gol, Stone Home, Assi Market Food Court. Diner * Brunch at Diner was my first foray into Williamsburg. 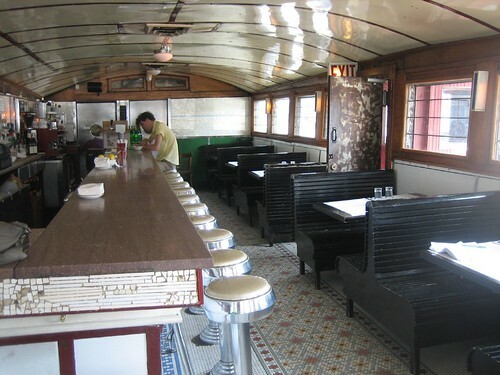 I loved the old school booths, bar stools and counter until I realized that the decor was the only thing special about Diner. I had a housemade sausage sandwich and a squid salad. The octopus salad was over dressed with an extremely acid vinaigrette. The sausage sandwich was fine, nothing special. The fries were the best thing served. When I go to a neighborhood place, I expect decent food, friendly service and fair value which enables neighbors to come often. , but the unneighborly prices weren't justified by the food. Russ & Daughters *** - smoked sable was great, but needed to be put on a bagel or in a sandwich too salty by itself. Returned for the Mensch, a sandwich of sturgeon, cream cheese and fish roe on a bagel. 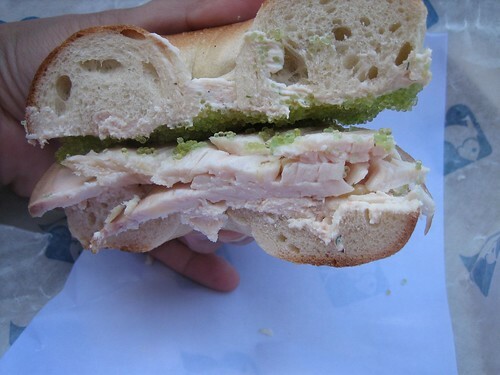 The filling combination was excellent but a little muted by the bagel. It was perfect after I removed the top half of the bagel. Prune *** - brunch, got in for the first seating though I have to say that there wasn't much of a wait when we left. 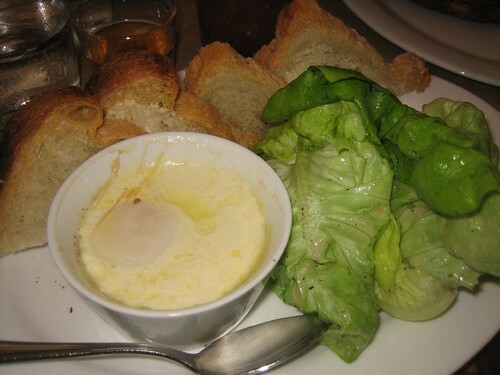 The egg on cocotte was a beautifully cooked soft egg over pieces of chicken served next to a salad of butter lettuce and buttered brioche very nice. 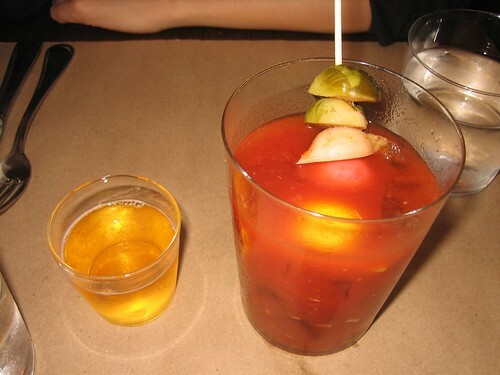 Loved my matchbox bloody mary which came complete with a shot of beer on the side and a skewer of radish and brussel sprouts. Kee's Chocolates *** - Dark chocolate with almond ganache, green tea, jasmine with ganach, sesame ball truffle. Yoghurt II *** - next to Grandaisy. Traditional Greek Yogurt served with choice of fruit topping and nuts. I got the apricot fig and walnuts. 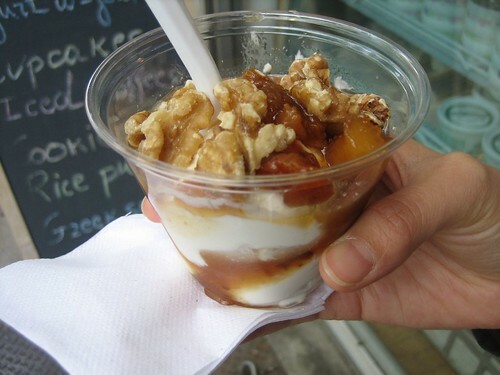 The yogurt is full fat and tart so it works well with the very sweet apricot fig compote. Arturo's * - ok pizza, friendly service. Thin crusted NY style, the cheese was a bit too thick and chewy for my tastes. The crust was crisp with a more bread consistency than the light crust at Luzzo's. Artichoke *** - standing in a short line I observed the thick bready looking slices being handed out and I started to wonder if I was wasting precious stomach space on this one. Thank goodness, the spinach and artichoke slice was a lot better than it looked. The crust was crispy on the bottom with another bready layer on top then a very good garlic cream spinach and artichoke topping. The topping was very good, would be good as as a spread on some french bread, which is really why this slice works. 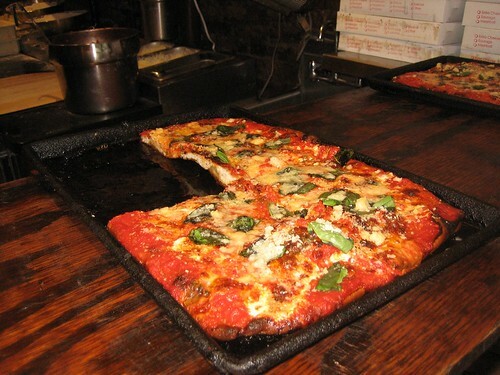 The square plain, is excellent crispy crunchy fried and blackened on the bottom with a very bright though slightly sweet tomato sauce with pieces of basil. More charred than the DiFara square and very nice. Next time I'd just get the square. Minca 0 - a disappointment. The pork broth was overwhelmed by garlic and needed some salt. I ordered it with thick noodles hoping to avoid the limp pallid taste of the thin hakata style noodles. These noodles were not good. Very bland and though they were cooked right, just didn't have any flavor and really didn't seem like proper ramen. Num Pang *** - I walked by this place on the way to my flat. There was a small line so I grabbed the menu. Returned later for a peppercorn catfish sandwich which is exactly like a banh mi with the usual cilantro, cucumber, and shredded carrot. The Cambodian touch was the fish which had a soy pepper glaze. The fish and the spicy chili mayo really made this sandwich. I was already happy when I turned to my side of grilled corn. 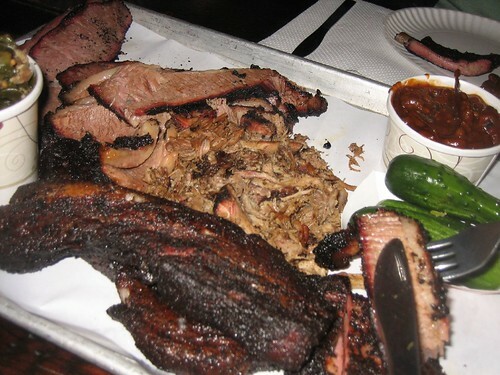 It's common in California at bbq's so why was this one so good. 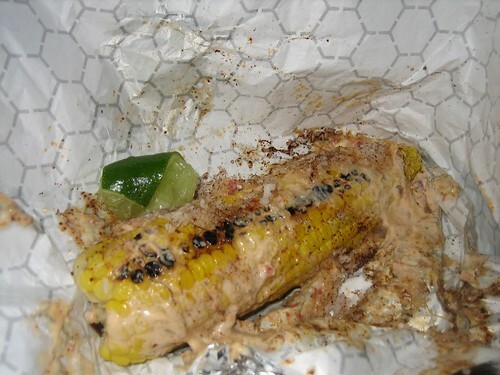 The corn was smokey from the grill and the chili mayo played against the sweetness of the corn. The finishing touch of coconut flakes and chili powder added a salty note and a nice contrast in texture. The menu has some other interesting looking sandwiches and their specials board showed a five spice pork belly sandwich which I'd order next time, but the real draw for me, would be the corn! Ippudo ** - Akamura (modern) which had a rich garlic salty sesame broth and juicy thick cut chashu with a nice layer of fat. 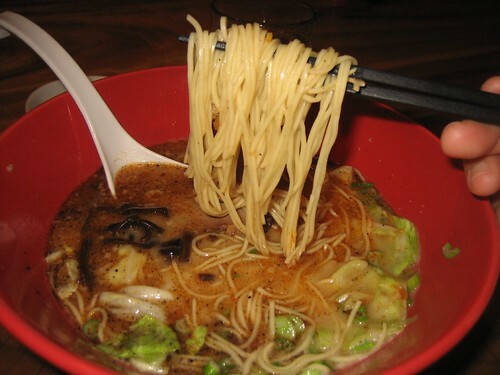 The noodles were a bit thin for my tastes but they had enough strength to stand up to the deep rich broth. With the salt level of the broth, I think I prefer a thicker noodle. Go back and get the spicy soup with thick noodle in the lunch set with the rice. 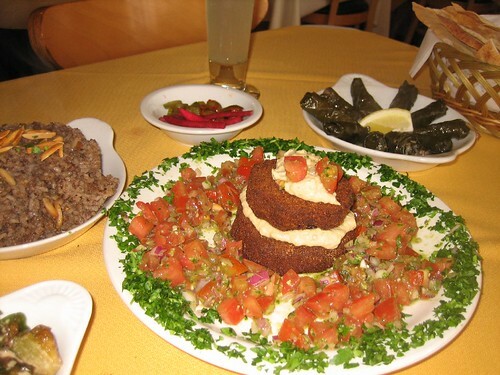 Tanoreen *** - A spot in Bay Ridge recommended by Grace for homestyle Middle Eastern cooking. The mezze was great: hummus, eggplant napoleon, haswa (ground lamb, egyptian rice, pine nuts, almonds toasted and tanoreen spices), grape leaves with meat with a perfect ratio of meat to rice and without the highly acidic vinaigrette, roasted brussel sprouts. This is a place to return to for the entrees, the spices are nicely balanced and beautiful freshness. Luzzo's *** - A sit down pizza place that was very close to where we were walking so we stopped in. What a surprise, a typical looking pie turned out to have a wonderfully chewy, light, spongy, crispy crust. 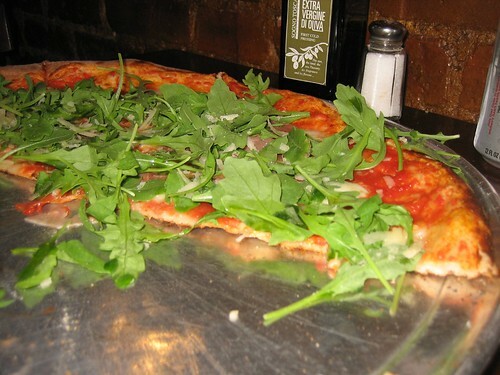 So good that the toppings of arugula, prosciutto and shaved parmesan interfered with my enjoyment of it. I would love to go back and just get a plain Margherita, Neapolitan or one with truffle. The coal oven seems to make a difference. Lanzhou Hand Pulled Noodles * Food stall in the Golden Mall in Flushing. The noodles are not as good as they look. They are fresh but too soft and floury. Luigi's Pizza ** A tiny little slice place near the Washington-Clinton subway stop in Brooklyn. It looks like the pizza shops on every other corner in NY. No where to sit, you just grab and go. 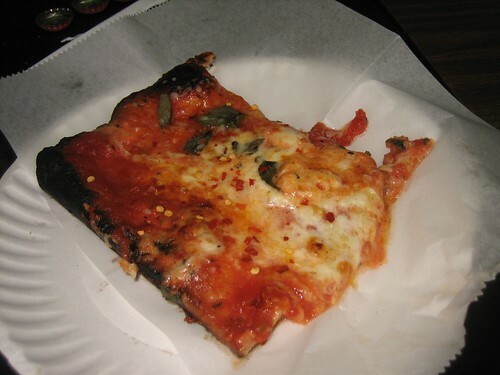 The square slice was crispy and had a very bright tomato sauce, which cut through the thick dough and balanced the little charred bitter parts of the crust. Flower Shop Tofu Stand *** Grabbed some sweet dou hua from the stand in the flower shop. Good tofu with a very gentle bitterness counterbalanced with honey syrup. My Aunt insisted that I get it topped with peanuts and that was a great call, nice to have a slightly savory element to it (like salt added to a dessert). Fette Sau ** This bbq place in Williamsburg has a fun atmosphere in a warehouse space and is set up for communal dining at picnic tables in and outside. They have pulled pork shoulder, beef brisket, boneless beef ribs, St. Louis style pork ribs, and the best of all berkshire pork belly. There are also some sausages, but they didn't look that exciting. The standout is the pork belly which is basically eating pig fat with a tasty coating of dry rub and a nice smokiness from the grill. It's definitely not something that everyone would be able to stomach. I thought it was delicious. The pulled pork was o.k., beef brisket looked so much more moist than it really was, the boneless beef rib was dry but had good beef flavor, and finally the St. Louis style pork ribs were not to my taste at all. Far too smokey, just one note I could only eat two bites (the second one was to confirm my opinion after the first bite). Basically everything is just O.k. but the pork belly is great, if you go for that sort of thing. I ended up smearing some of the pork belly fat onto my brisket to moisten it up. Others enjoyed the collard greens and the bbq beans. I just didn't have room in my porky belly to fit any of that in. I would return for beers and pork belly, but would pass on the rest of it. Mimi's Hummus *** - a nice neighborhood cafe type of spot in Ditmas Park. The hummus with beef and pine nuts was awesome. Creamy and topped with "shuy" the family's special recipe for a blend of herbs and chili that added another dimension to the beef pine nuts and the whipped hummus. DiFara **** - 3 p.m. on a weekday, no line at all and I can see why this place is an institution, Dom the owner pizza maker practices it like an art. Takes his time making each pie individually and with a lot of care. Not rushing, not throwing the ingredients on, but making sure the dough is stretched correctly and the cheese is right, then a free hand with the olive oil, makes the thin slice so good, I had to have a second slice. Returned a week later and had two slices of the square. Both the regular and the square are great, but the square stands out in comparison to other pizza shops. Weekday afternoons are the way to go. Ocean Jewel ** - dim sum in Flushing. Good variety, favorite item was the black sesame balls sprinkled with toasted pine nuts. Overall, standard dim sum that can be found at numerous spots in the Bay Area. Green Grape Provisions * - tried to get a snack at a few places but the kitchens were closed. The Spanish Harlem sandwich with jamon serrano and manchego. The jamon was little too salty and lacked depth, but the manchengo was good. This place is not that exciting particularly in comparison to Bi-Rite. Grace's Sunday Supper ****- Highlight of my trip. Boiled pork belly, bi bim bap, stuffed perilla (pictured), pan chan. Second Sunday: ribs, kfc (korean fried chicken) -- so good even a vegetarian had to have some. More details to come. 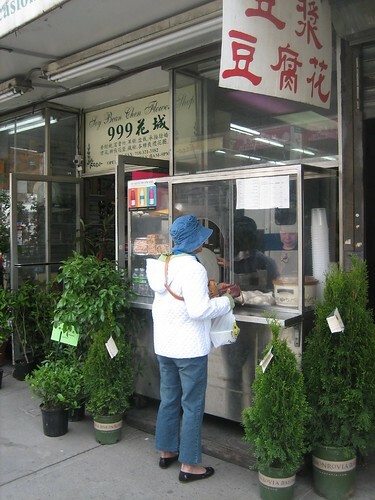 Flushing Food Tour ****- Started at Best North Dumplings **, a little food stall inside a store. Tried the pork and fennel dumplings which were a nice change of pace from the typical dumpling. Grace liked the chewy skin, but I thought it was too thick. Then headed off to the Xian Famous Foods *** One of the stalls in Golden Mall a collection of basement food stalls. We had a lamb burger and liang pi. 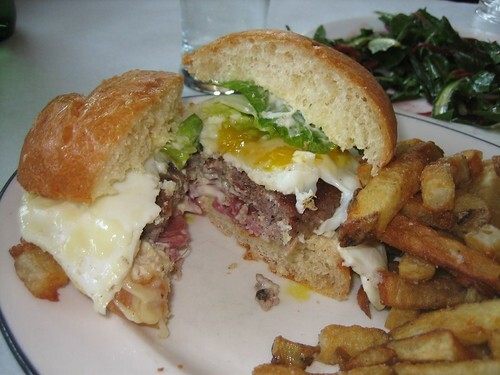 The lamb burger was far too salty though the smokey cumin flavor was nice. Liang Pi was the best thing we had that day. 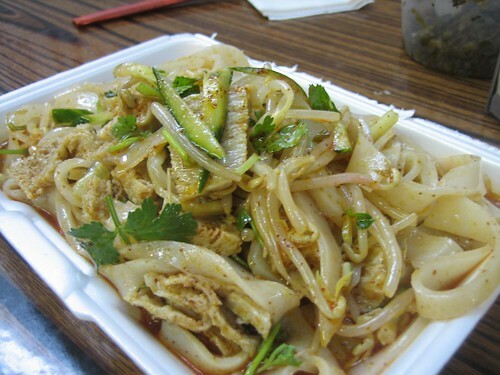 Hand cut noodles with a nice chewy rubberiness and a chili seasoning that you don't see, it must be chili oil that is uncolored, the heat sneaks up on you and works wonderfully. 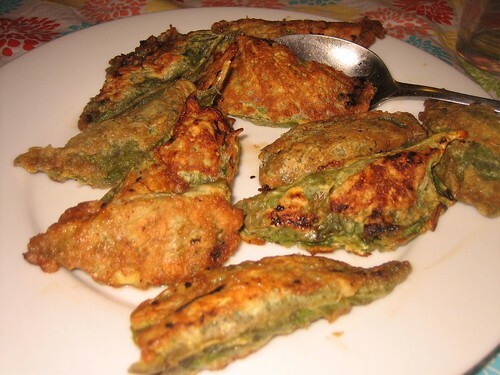 The mung beans add a crunch and the pieces of tofu help bring out the cumin flavor. Grace noted the cooks didn't look Chinese, well they are likely Western Chinese and Muslim. On a return visit, I sampled the food stall with the blue sign next to Xian Famous Foods. Their shaved potato with chili was delicious and a nice crunchy counterpoint to the chewy liang pi. We headed to the Flushing Mall to refresh ourselves with some shaved ice with pineapple, peanut, lychee jelly, red bean -- the shaved ice was too roughly shaved. Chunks of ice rather than the smooth and fine product I had in Taiwan, but refreshing nonetheless. Headed back to Golden Mall and found it difficult to cope without being able to read Chinese - I thought of how much I fought Mandarin classes when I was a kid. We wanted to walk more, so I headed to Yi Pin *. Had two types of dumplings and the green onion pancake. The dumplings with chinese chive were find and the others with Zhee tsai were more interesting, but I liked the skins they were slightly thinner than Best North, though not thin by most standards. I just had to put in my two cents--my preference for the thicker skin must be from Korean v. Chinese food values. I am so flattered by the way you describe my dinners!